Another of my bun moment. I wanted to try out another bread baking experience. I did this back few months ago. Always bake when we will have visitor. Is good to share the baking and one can remind slim afterall sharing is caring. I would like to show my care and love in the food I am baking . I plan to do a western roasting dinner for the night. Thought of baking some small bun and have it serve before the main. Yup , I still do not quite understand in the fine dinning restaurant , we always been serve some fresh bake bun before our main course come. Perhaps the portion of a fine dinning is always small, so is good to fill your tummy up with some carbo so the end of the meal you will feel full. 2.Mix the ingredient for Bread (A) until well blended. Add in all the wet ingredient for bread (B) except butter and knead to form rough dough. Add in the tang zhong and knead until well blended. 3.Add in butter and knead to form elastic dough.that passes the window pane test. 4.Let it proof for 40minutes. Divide dough into 50gm each , mould it round and let rest for 10minutes. 5. Place onto greased pan and let proof for another 50minutes. 7. Bake at preheated oven at 170(fan)/190C for 15minutes. 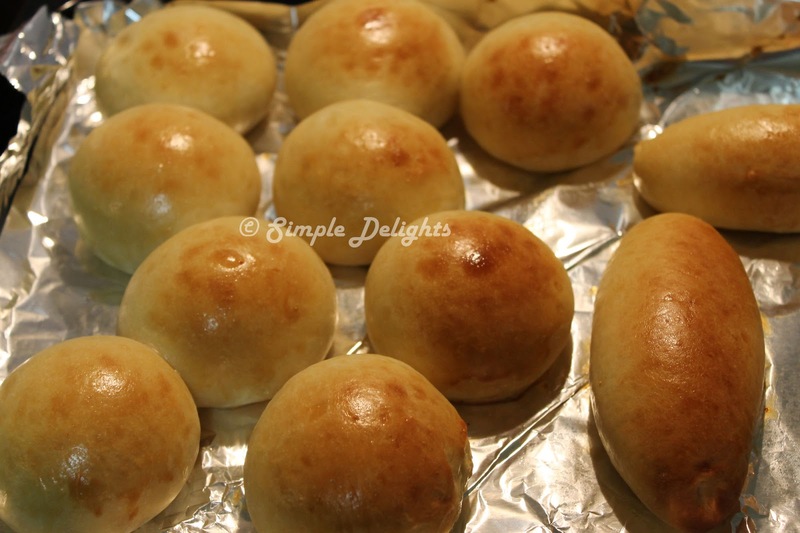 I also make some bun into oval shape and prepare to put some pork floss like the pork floss bun I always love for my breakfast next day. I got the recipe to make the cream to go with the pork floss on this bun. 1. Mixed the condense milk and mayonnaise together , slice half way down the middle of the oval shape bun, spread the cream and sprinkle pork floss according to your liking. I will definitely make it again . Thanks pretty. Read your birthday cake it look gorgeous and am sure the taste is fabulous..